Ana and Derek were both there to help start up the new Digients (pets/robots/virtual creatures). As the years pass and the technology grows obsolete, and more and more people put their Digients to sleep permanently. Ana and Derek keep on going with their babies though, even after their company shuts down. Year after year we see the slight evolution in these virtual companions and see the effects that new technology has on their lives. Ana and Derek have to face many things to protect their Digients from a state of permanent sleep, including realizing that a person can love an object with AI absolutely. So this wasn't a bad read by any means. There just wasn't a whole lot of meat to it. Maybe if you are really into Sc-Fi you would enjoy it more. I liked the illustrations in the book, even though one was a bit much. This was an interesting look at technology and how bigger and better things always crop and threaten the existence of older items. A lot of this story seemed like to people who were raising adopted children. I mean the Digients spoke like children and played like children. For this reason I can see why they would be hesitant to sell them to the company that approaches them. This was a nice little novella, and I'm glad I read it, because it was pretty interesting. If you like Sci-Fi and technology than I would recommend you check this out. "Her name is Ana Alvarado, and she's having a bad day." "'Why you want us stay angry forever?'" 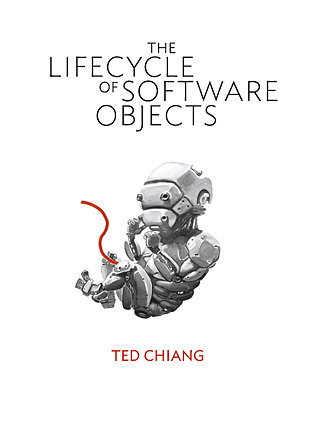 I agree that there wasn't a whole lot of meat to this story although I think it was pretty heavy-hitting right up until the end ^.^ Have you read any of Ted's other works? Hm, very intriguing. I hadn't heard of this book before your review, but it sounds interesting. Still, I might wait to see if the library purchases a copy.